A multi-server setup consists of multiple servers, which can each have more than a thousand simultaneous connections at any point of time. Multi-server configurations are of two types, master-master and master-slave. This section discusses the master-slave setup, and the master-master setup is discussed in Section 4.0, Multi-Server (Master-Master) Deployment. Multi-server configurations are beneficial for organizations that are expanding their employee strength. This type of setup is also useful for organizations that have their workforce spread across the globe with multiple branches across countries and continents. You can use a multi-server deployment to synchronize and share data across the globe with a predictable response time. 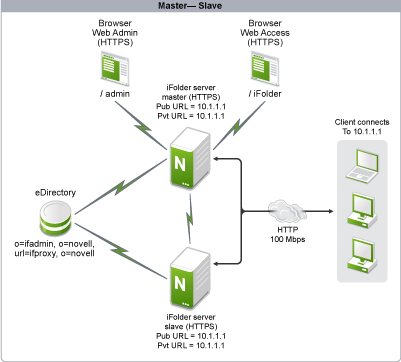 You can convert a single-server system to a multi-server system by connecting an additional server to the main server and creating a master-slave configuration. A multi-server (master-slave) setup is illustrated in the following figure. In this setup, the iFolder server and the iFolder database are located on Open Enterprise Server (OES) servers with client workstations connected to the iFolder server. The iFolder master and slave servers are connected to each other to exchange metadata information. The Web Access and Web Admin consoles of the master server are accessed through a browser. User authentication is done through the eDirectory secure LDAP protocol and all the server-to-server and client-to-server communication is done via HTTPS.